Maga’s wife and child have drowned. We need your help. 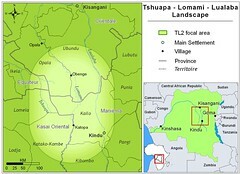 Maga accompanied Ashley last year on the first trip up the Lomami. He is from distant Monkoto, the center of the Salonga National Park. He came as part of the “bonobo” team that had worked with Ashley to census the bonobo of the Salonga in 2005 and 2006. Nancy and Maga on the day of their wedding. Photo by Ashley who sent it to me. The heart of the team, Bernard, Maurice, MAGA and Sabine, has stayed with our project, but Monkoto was too far away. 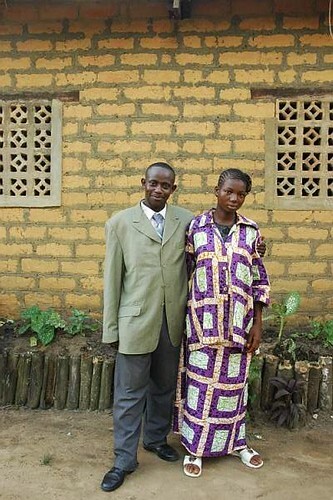 Maurice and Sabine have already moved their families to Kisangani. Maga’s wife , NANCY, was doing the same with their baby boy, born in 2006 and named after ASHLEY. We had left money in Kinshasa for the trip by airplane from Mbandaka to Kinshasa and then Kinshasa to Kisangani. 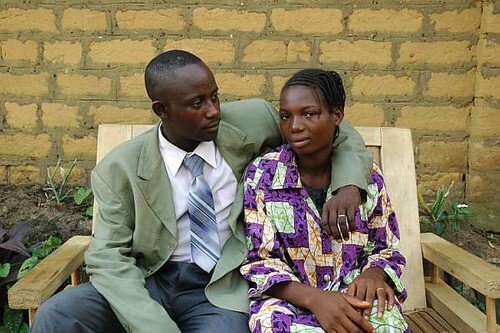 The families of Maurice and Sabine waited in Kisangani to welcome Maga’s wife and baby. But that will not be. 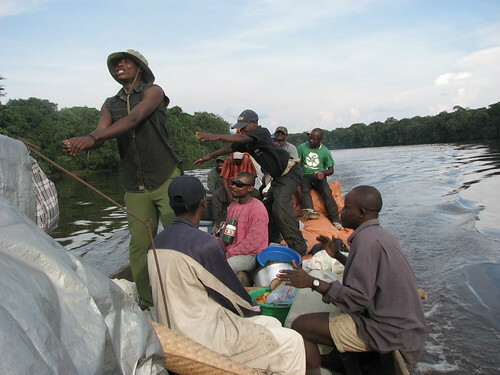 The first stage of the trip was by dugout, without outboard, from Monkoto to Mbandaka. It is a trip of five days, 24hr days. The dugout was traveling by night. It turned over. NANCY and BABY ASHLEY drowned and their bodies have not been recovered. The news came via WWF satellite email from Monkoto. I communicated it to Ashley (our Ashley) by satellite thuraya. He was with Maga in the new primate camp west of Obenge. “After you told me the news I decided that it was best to get out of the forest right away and when back in Obenge tell Maga . Yesterday after getting back I told him and it was awful of course. He was screaming and crying for quite some time and I was crying as well. His child was named after me (Ashley) so it feels particularly difficult but maybe I’m just being selfish. African villages are amazing places at these times and by the evening dancing around a huge fire and tom toms were in full swing. This went on for many hours. It was really amazing and very beautiful to see. So different to the English who all just sit around feeling uncomfortable and wanting to get away as soon as possible! Now Maga is with me (Terese) in Kinshasa. From Obenge he took our motorized dugout to Opala. 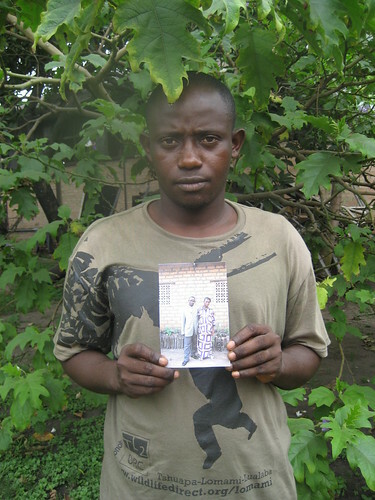 He rented a motorcycle through the Lengola to Kisangani. From there he flew to Kinshasa and we are now looking for a flight to Mbandaka at the first possibility and then on up to Monkoto. We hope to cover all MAGA’s travel and expenses and have him back with us as soon as he is ready. And we will use any donations in that order. Mourning first, Nancy’s family second, Maga third. “J’ai les remords indescriptibles de vous annoncer la double triste nouvelle de la mort de l’épouse de Maga, Mme Nancy et son enfant, hier la nuit lors d’un accident de navigation. En fait, Nancy devrait rejoindre Maga (à Kin et/ou Kisangani) via Mbandaka. Elle avait pris place à bord d’une pirogue. Celle-ci a chavirée hier 13/03/08 la nuit vers 2 heures du matin à quelques cinq courbures avant d’atteindre Wafanya. L’accident s’est produit entre Lokofa et Wafanya. Jusqu’ici, les corps ne sont pas encore retrouvés. Il y avait 12 personnes dont 07 survivants et 05 morts. C’est tout Monkoto qui est endeuillé. This entry was written by Terese Hart, posted on 2008-03-28 at 12:08 pm, filed under About the project. Bookmark the permalink. Follow any comments here with the RSS feed for this post. Post a comment or leave a trackback: Trackback URL. Oh, Terese, I’m so sorry, how tragic. I will send what I can straight away. Terese, we can’t make comments on the pay pal anymore…just earmark mine for the MAGA Fund, please. Mine is for the MAGA FUND, too. Please let Maga know that we are all so sorry for his loss. My donation is also for the Maga fund. My sincere condolences to him and Nancy’s family. This is so very sad. My thoughts and prayers are with his extended family too. This is such terrible, terrible news, I am so sorry…please tell Maga and Nancy that many, many people are thinking about them during this tragig and sad time. Maga is flying to Mbandaka this morning, and he and all of us are very thankful to all of you for contributing to the Maga Fund. Thank you Theresa,Michael, Sherri, Dana, Christine. Ashley and John are up the Lomami with the teams and we hope Maga with his great team spirit will be with them again soon. Thanks for this update. I think we are all shocked to the core about this. Life is so fragile…and precious. Terese & John: We extend our sympathy to Maga and your team for the tragic loss of Maga’s wife and son. We’ve sent a donation via Pay Pal to help fund his travel. Our prayers to Maga for strength in the coming days and safe travel. Heart felt thanks from Kinshasa. Wonderful for Maga and all of us to have a global caring community!! From Boonville to Obenge. please let my donation from paypal go to the MAGA FUND too. It is so sad that it happened. I hope everything goes better for the rest of the expedition for all of you and the bonobos. What a terrible tragedy I am so sorry this happened………..you are in my prayers and I will try to send what I can soon! Theresa,James, Annie and everyone, THANK YOU again! We now know that Maga arrived in Mbandaka and continued up the Ruki by dugout. Next we will hear is once he has arrived in Monkoto by WWF satellite connection. We will keep you informed! Thanks Terese. By the way, James Bonobo Fan, he is only 10 years old and has his own website, dedicated to Bononbos. He is our hope for the future of conservation. To all of you. Your all very kind and it will help Maga i am sure in some way. He has gone to the small village of his former wife for now. He has a lot to go through whilst he is there. Sadly because his wifes body (the babies was finally found) was never found there are a lot of rumors of witchcraft etc. Just adds to his level of difficulty. He needs to be strong and brave and when he is ready he will absolutely be back with us. I personally find it very difficult without him as he is such a great person. Glad to see that there are such young Bonobo conservation fans. Gives hope for the future.